omething new is happening with old bikes. 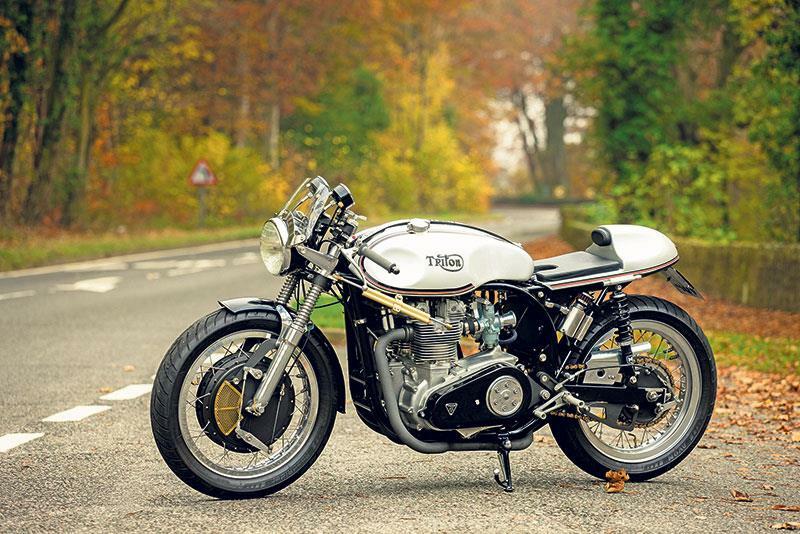 No, we’re not talking about the trend for grabbing a CB750 then slinging on a set of clip-ons and a brown seat. This is about owners with decades of experience re-imagining how yesterday’s bikes could be – and using today’s products and knowledge to make it happen. The four machines you see here might look as if they were built years ago. In fact they take full advantage of what the modern world has to offer. And that makes them immeasurably better than the clanky old Brits they’re based on. In the 1970s and 80s tools cost a fortune, no-one owned a hydraulic ramp, bolt-on stuff was scarce and the main information source was folklore. Today anyone can put together an awesome workshop, call on an army of brilliant engineers and fabricators, and use the Internet to root out £50 remote reservoir shocks, or a set of brake lights for a milk float that just happen to suit a hand-beaten tail unit. Britain has become a special-builder’s paradise. The only thing you need is imagination, determination, skill – and the willingness to spend a few quid. Like the guys who built these. If you want power from an old British bike you buy a Trident. Never mind that it was a stop-gap design to turn a twin into a multi, and is therefore heavy, over-complicated and frankly daft; these days you can get all that sorted at Brentford’s P&M Motorcycles. Megacycle 51135 cams, a gas-flowed head with central 10mm plug conversion, hardened exhaust valve seats, plasma nitrided valves, high capacity Morgo oil pump and Pazon ignition. The result is 80-85bhp, no oil leaks after three years and the most dramatic power delivery you can imagine: all revs and vibes, threshing pistons and howling exhaust. With the Bob Newby clutch and belt primary drive the powerplant is 10kg lighter than stock. The incredible three-into-three exhaust was made by Shropshire custom house Metal Malarkey, lightly modified, and finished with F1-spec satin black Zircotec. Staffordshire fabrication house Made in Metal did (among many exquisite details) the aluminium seat unit, which hinges up to reveal a superbly finished custom wiring job by Geoff Chilton. Clocks are new Smith Chronometrics, while the magnesium yokes, forks and the front brake come from Molnar. And before you rush to judge it as a cheque book special bear in mind that Jim, a design engineer, made many of the machined parts on his Warco lathe and mill. 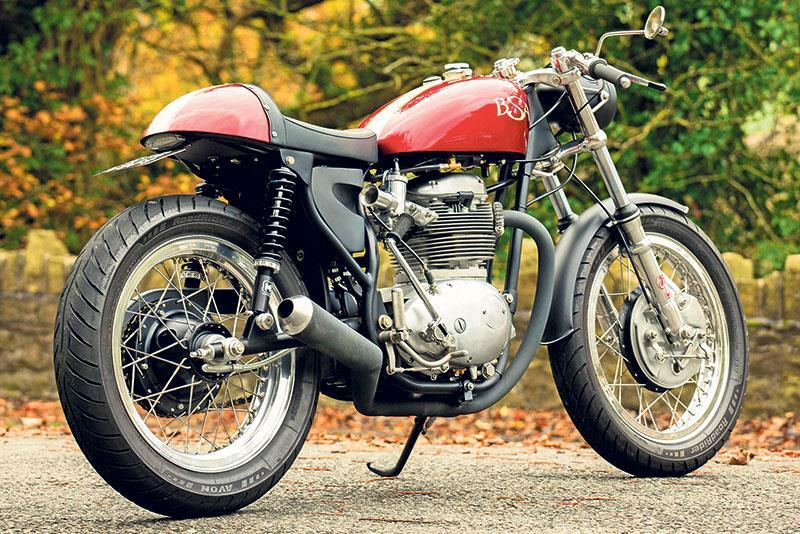 He also used a lifetime of riding Brit bikes to design the function of the entire build; from the position of the engine in the Featherbed frame, to the invisible rear brake switch, and the single-cable throttle system which combines a light action with an unheard-off tickover from the race-spec Amal carbs. The last part of the little Triton’s agility is the tiny tank. It came with the jalopy donor bike, but to start with was the usual five gallons. Jim got Made in Metal’s Neil Adams to lower it, and fabricate an aluminium seat unit to suit. 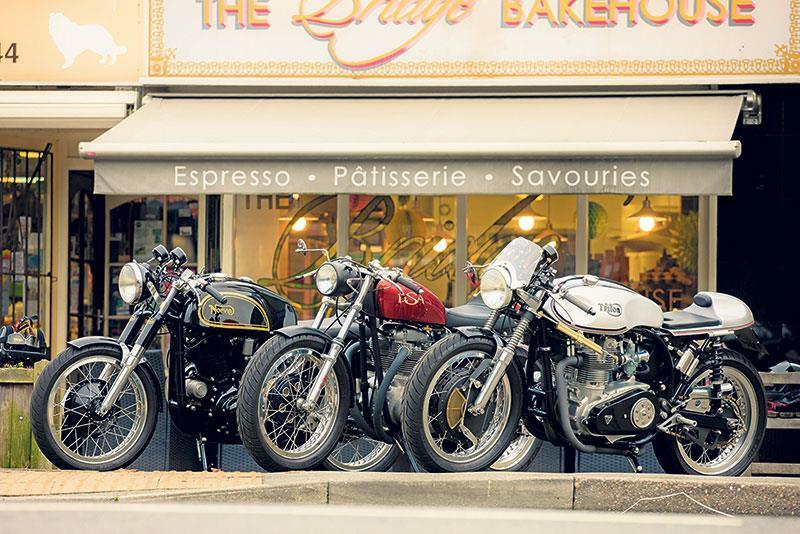 It gives the bike a feeling of almost total freedom from bulk – but there is a snag. “It’s got a range of about 30 miles!” admits Jim. “It’s down to the shape of the underneath, and where the petrol taps are. It’s only about a gallon and a half anyway, and it runs out when it’s still a quarter full. So I’m going to get Neil to do another version, about three and a half gallons.” Like the existing tank, the new one will be mounted with rubber bobbins rather than the traditional dodgy strap. Most of the detailing comes from the big Triton: double gearbox adjusters for accuracy and stability; milled footrest brackets; engine sprocket as close as possible to the swingarm spindle to minimise chain tension variations; a hinged seat unit; and another Geoff Chilton custom loom, this time hiding inside the frame tubes: “You just pull the wires through with welding rods,” says Jim. Traupel in Germany,” says John. “He was the only guy I could find at the time who could build a BSA with a 90-degree crank.” These conversions are far from straightforward; they need custom cams, pistons and ignitions too. The big-bore aluminium barrels are a Traupel speciality; the Brummy originals are cast iron. The rest of the bike is crawling with amazing detail. 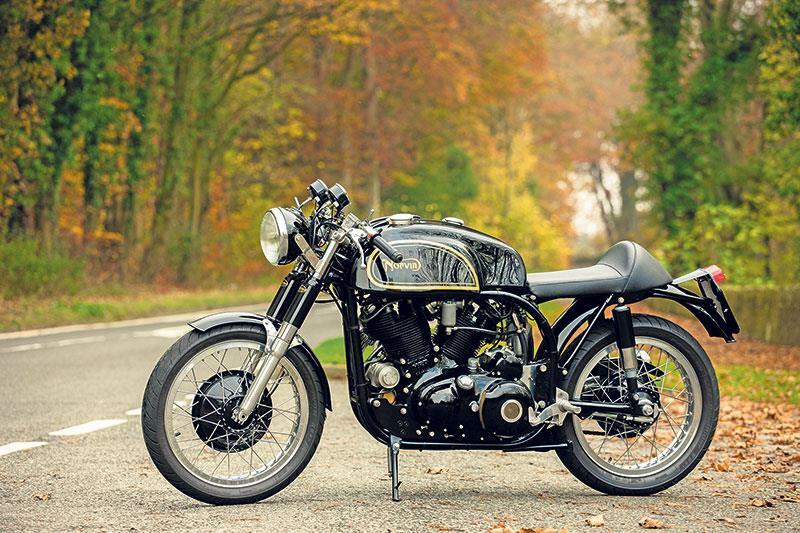 John wanted the clean lines of a speedo incorporated into the headlight, which he found in a Norton Navigator 250. The Lucas switches have to be reversed so they don’t catch on the cables and kill the ignition. Clip-ons are Daytona Omegas with vernier angle adjustment. The swingarm is a complete one-off. The rear LED light is almost invisible until it switches on. The aluminium seat was made on an English wheel by a sports car bodywork expert. Rearset footrests on a BSA are usually incompatible with a kickstart, but weeks of careful design have solved that perennial bugbear. More cunning still is the horn: it’s the rubber bung in the middle of the tank. On the original bike the bung covers an anti-vibration mount. The bike feels light and lively to ride. 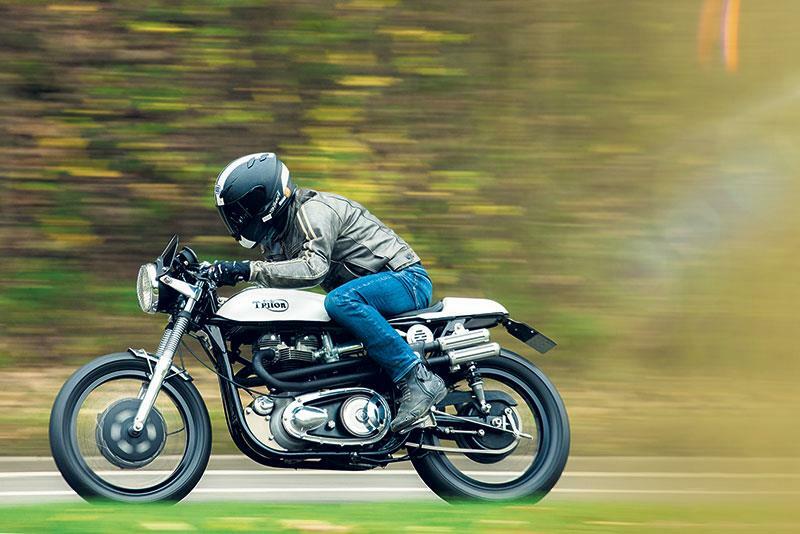 The old-school carbs make it gurgle a bit until it hits a sweet spot, at which point it catapults you forwards, rather like a single switching to a twin. Hook up a gear and it does it again, with the thrust effect arriving in fourth (top) at 70-80mph. It’s a bit like an old Ducati Monster, but with better steering and weight distribution. Cornering on the chunky Avons is completely neutral. The original A65s vibrated like road drills and were built with their wheels three eighths of an inch out of line to try and reduce weaving caused by the lopsided engine. If only BSA had done it like this.